The Ingles Adjustable Cello and Bass Stand allows you to keep either full or fraction size cello or double bass (and the bow). 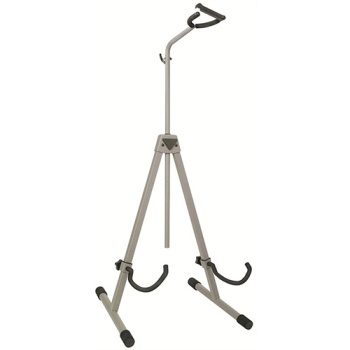 Folding nearly flat for storage, it features two height-adjustable cushioned arms to support the instrument's bottom and a third with a safety bar to secure the neck. The bow hangs from a cushioned hook out of harm's way, behind the instrument and off the floor. Grip knobs for easy adjustment to height of stand.